The four standard variations of Model N standard grips from left to right: 1) round top stylized "C" black checkered hard rubber (from serial number 1 to approx. serial number 105,000); 2) square top black checkered hard rubber from approx. serial number 105,000 to approx. serial number 345,000); 3) machine checkered walnut with forward-facing flush medallions on both grips (from approx. serial number 345,000 to 350,000); 4) machine checkered walnut with forward facing flush medallion on the left grip and left-facing flush medallion on the right grip (from approx. serial number 350,000 to 409,900.) Pistols in the 420,001 - 420705 range are encountered with Type II or Type IV standard grips. 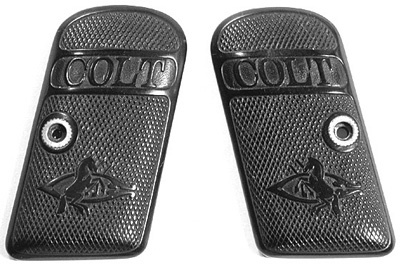 Front and back of a pair of flush pre-war grip medallions used on all Colt grips after 1924. 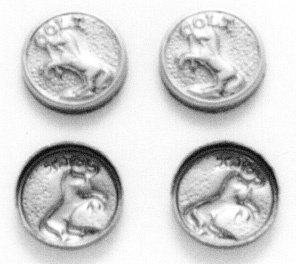 These are late variations of the medallion. The earliest variations were more detailed.